Sr. Savina D’Agostino, (M. Secondinus), FMM died on Friday, January 18, 2019 at Elmhurst Rehab in Providence. 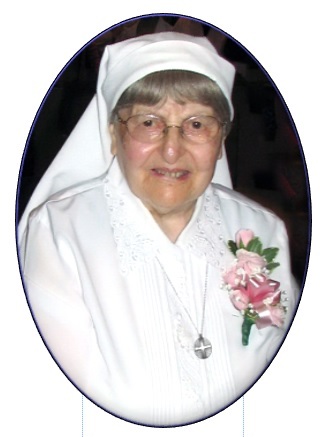 The eldest of six children, Sr. Savina was born in Providence, Rhode Island, August 29, 1913. At age 17 she was already an accomplished seamstress and, after working in a department store, volunteered in the workroom of the Franciscan Missionaries of Mary at Bell Street. Under the supervision of Sr. Secondina, Savina came to know the FMM as those who were simple but deeply spiritual. She experienced the Sisters in adoration in the chapel and realized she wanted to be an FMM. She entered in March, 1931 at Fruit Hill, N. Providence. Savina made her First Vows in September, 1933 and her Final Vows, September, 1936. Always able to adjust to new situations, Savina was then missioned to Hotel Alverne where the FMM worked with the elderly in St. Louis, Mo. Here Savina served as Assistant to the Superior, Director of Housekeeping and sacristan from 1973 to 1976. She also worked with the group called The Ladies of St. Clare. Then from 1976 until 2004, Savina was missioned to North Providence, RI to be Assistant, sacristan, a volunteer at the Day Center for the Elderly and to work with the Legion of Mary. When becoming part of the Assisted Living at Fruit Hill, she did some chores in the community and visited a local parish. Until lately, Savina continued to rise early and make adoration in the chapel as her first activity of the day. She often said that as long as her health was pretty good, she would be happy to help others with whatever they needed. She was often first to be present at community meetings and events, prayed for the needs of others, was clear-minded and walked everywhere with her walker. When someone would speak to her about a humorous happening, her laugh was instant and hearty. Among other things, Savina was admired for her consistent energy and even temperament. Sister’s funeral will be held on Monday, January 28 at 10:00 am in Holy Family Chapel, 399 Fruit Hill Avenue, North Providence, RI 02911. Visitation will be held on Sunday, January 27, from 4 to 8 pm with a wake service beginning at 7 pm in the same chapel. At the request of the family, those who wish may memorialize Sr. Savina by a gift to the missionary work of the Franciscan Missionaries of Mary via the chapel address listed above.